Breast cancer is the most frequently diagnosed cancer and the leading cause of cancer-related deaths among female population worldwide. Metastases are the common cause of morbidity and mortality in breast cancer and can remain latent for several years after surgical removal of the primary tumour. Thus, the identification and functional characterisation of molecular factors that promote oncogenic signalling in mammary tumour development and progression could provide new entry points for designing targeted therapeutic strategies for metastatic breast cancer. In the present study, we investigated the expression of proteins involved in cell signalling (growth hormone receptor (GHR) and NEDD9) and cell-cell adhesion (plakoglobin) in epithelial and stromal compartments of primary ductal invasive breast carcinomas and their axillary lymph node metastases versus non-metastatic tumours. 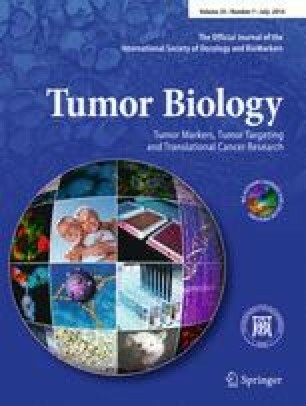 Obtained data revealed remarkable increase in the expression levels of GHR and NEDD9 proteins in both epithelial and stromal components of axillary lymph node metastases in comparison with those of non-metastatic tumours, suggesting that the expression of these two proteins may provide biomarkers for tumour aggressiveness. The online version of this article (doi: 10.1007/s13277-014-1827-y) contains supplementary material, which is available to authorized users. The work was supported by the Ministry of Science Education and Sports projects 335-0982464-239, 335-0000000-3532 and 108-1081870-1884.